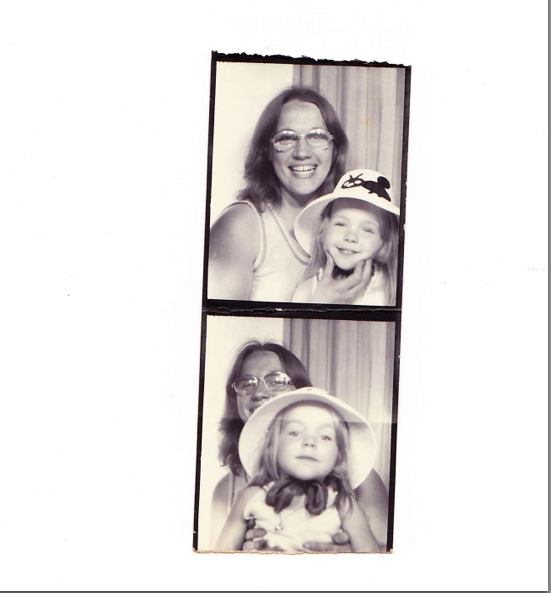 Me and my mother, 1977. Old Orchard Beach, Maine. In this photo, my mother is only 22 years old. 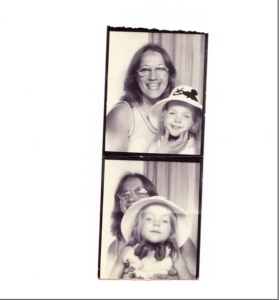 We are at an amusement park at the beach – in one of those photo booths. I don’t remember much about this day, since I was just three years old. But I wish I could remember it. Did we swim? Did we get ice cream? Was it warm? Were we happy? Shortly after this photo was taken, a seagull pooped on my shoulder as we walked along the pier. This is something I do remember. Or perhaps I just remember the stories my mother told me over the years. Apparently, I was horrified by what the seagull did. I cried and cried. Only blue cotton candy appeased me. Sometimes I wonder if I look like my mother looked when she was my age. And I wonder what my own daughter, Angie, will remember about our outings. Will she remember the time we swam with dolphins? Or the day at the movie theater when she screamed because Frankenweenie was too scary? What about that time she got to pet a shark at the aquarium? Or that time she caught a pickerel at Parker Pond, and the fish jumped out of her net and flopped its way back to the water? She thought the fish was mad at her and was going to bite her as payback. I hope she remembers the first time she danced on stage and the first time she swam in the pool unaccompanied, as well as the last time she needed me to push her on the swing at the playground. I hope she holds all these memories and all these experiences, and not just my stories about them.